The $5,000 workmanship guarantee is one of the main highlights of the Pro Membership package. Although it looks like it was made solely for the benefit of customers, did you know that businesses can actually get a lot from it too? Things don’t always go the way we plan. No matter what job and whether or not they’re being done by professionals, things could go wrong. And when a job goes wrong, money is always needed to fix it. With this in mind, ServiceSeeking.com.au decided to create a Pro Membership package that offers a workmanship guarantee of up to $5,000. Customers are automatically eligible to benefit from it by simply hiring a Pro business on the site. If you’re thinking that you won’t get anything from this workmanship guarantee, you got it all wrong. 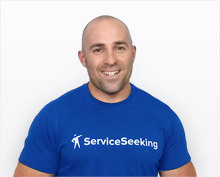 As always, ServiceSeeking.com.au came up with this service not only with customers but also with businesses in mind. Here are some of the things you can look forward to because of this upgrade. Customers want assurance that they won’t be shelling out cash when something about their job goes wrong. If they see that they won’t be shouldering extra expenses because of the workmanship guarantee, then they wouldn’t have second thoughts trusting you. Once customers know that their job will be protected if they hire you, you’ll definitely be among their top choices. All you have to do then is give them a good quote and convince them that you offer the best deal. Let’s say you do mess something up accidentally while on the job. If you’re on a Pro Membership, you won’t have to pay for repairs. As long as the cost doesn’t exceed $5,000, we’ll take care of it for you! Offering the $5,000 workmanship guarantee is all about helping you and your customers have the best work experience through ServiceSeeking.com.au. Interested? Feel free to talk to our Business Support Team about it.